by Clyde Hall, Brendan Hodgdon, Mickey Rivera and Jarrod Jones. Undercover is our opportunity to lovingly gaze upon gorgeous works from magnificent artists. From Tonči Zonjić’s cover to ‘Crimson Lotus’ #3 to Patrick Gleason’s latest ‘Action Comics’ variant, here’s what we’re loving this week. MR: Superman crashes an air show. Forget the freezing cold and darkness of Winter 2019, and the 24-hour news cycle and the many problematic aspects of United States history. Unhitch your mind from reality and assume two things: One, it’s a beautiful warm summer day, and two, you’re American. In a park in some obscure Midwestern American town, the locals gather to watch their national defense perform a choreographed show of force. The air fills first with the smell of grilled hot dogs and the din of children screaming impatiently, then with the sonic boom of jets zooming by at speeds you can’t truly comprehend. Flying right beside them, needing no steel enclosures or other protective equipment, is a man you’re told came here from another planet as a child, but was raised on a farm not too far from this very park. This boy grew up to become immensely powerful, made the papers, became a national hero. The locals watch him on the news and take personal pride in his corn-fed country manners, kindness that wields strength enough to lift mountains. American strength. Your mind wanders. This supernatural man, if so inclined, could crush those American jets into little metal basketballs and lob them each into the sun. The over-grilled hot dog you ate begins to raise a storm in your stomach, exacerbated by the howling jets and the man-shaped anomaly flying noiselessly behind them. You begin to realize that it’s by sheer luck of interstellar trajectory that he’s on your side. CH: Tonči Zonjić knows his way around Neo Pulp. His Lobster Johnson covers for the Hellboy chronicles carry the visual equivalent of musty old newsprint. He also knows how to construct monster covers with images normally relegated to nightmares stoked by spirits and a late, large, greasy repast. 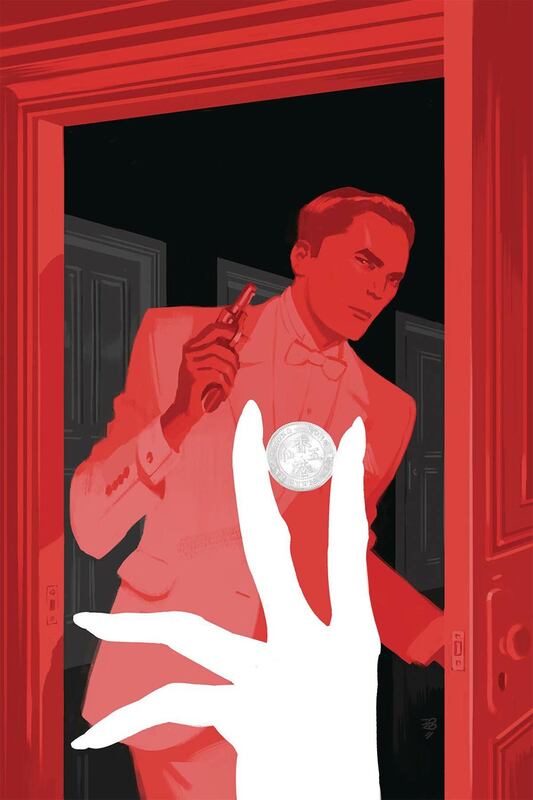 With Crimson Lotus #3, he flexes his artistic brawn on the dapper, dangerous elements of pulp adventure. A secret operative dressed to the nines, checking identical doorways down a darkened corridor with trusty snub revolver at the ready. It’s the dashing Lamont Cranston obverse of the coin, concealing a reverse of iniquitous prowling grounds and broken hooligans. The specie itself is prevalent, held coaxingly between the inverted silhouette fingers of a doubtless fatal femme. The blankness of that hand draws the viewer’s focus to it, then upward to the coin, then higher a final time to our hero, transfixed. It’s a Zonjić hallmark, never backing down from purified fields of uniform color (or lack of it) to stoke dramatic contrast. Shading is subdued. Reflection of the polished, diospyros floor equally subtle. The approach defines a capable intelligencer daring to plunge leagues beneath his depth in pursuit of Yumiko Daimio. Spy. Witch. Assassin. BH: When you’re rebooting a Silver Age character, it’s important to keep your take modern, to find a tone and voice that fits them into the current state of the medium. This is something that Kieron Gillen, Caspar Wijngaard and their team did to great effect with their debut issue of Peter Cannon: Thunderbolt. But even after such a revamp, it can be fun to reflect the new version of the character back through the prism of its Silver Age roots, as Butcher Billy does so effectively with this variant cover. Billy’s stylistic approach filters Wijngaard’s new take on Cannon’s costume through a nice retro aesthetic, bridging the gap between old and new. But even more importantly, the composition of the cover captures some essential elements of this series and its protagonist. 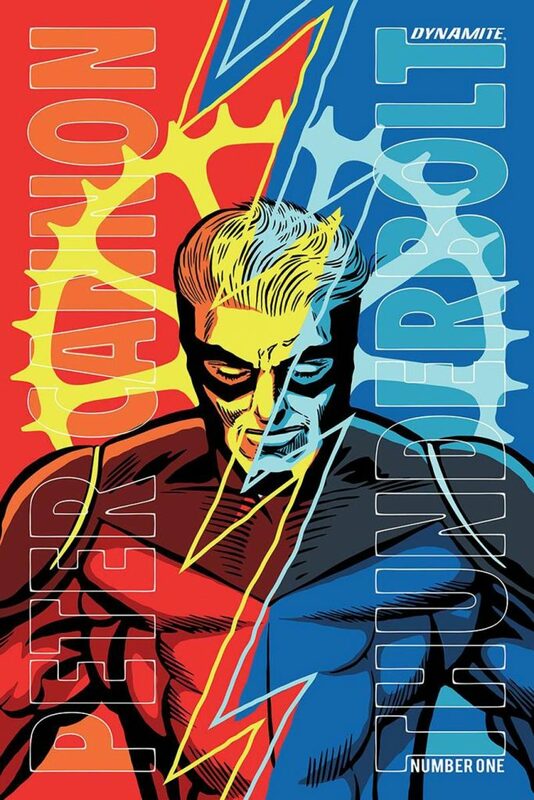 The lightning bolt bifurcating the cover and the red & blue halves of the image obviously tie back to Cannon’s superhero title and the color scheme of his costume. But the split image also hints at a central mystery of the book, and Cannon’s conflicted feelings that form the core conflict of this issue. 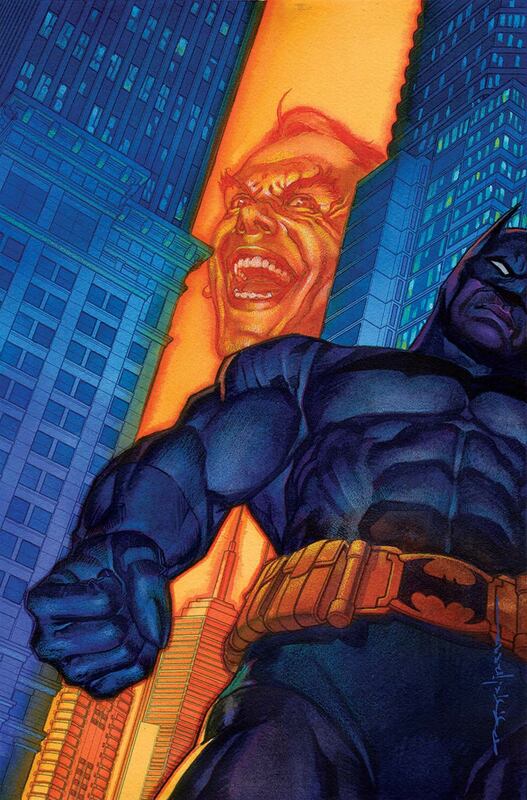 Billy’s cover summarizes the themes of the series, the origin of its hero, and the style of the main creative team all at the same time. It’s a succinct distillation of the great book within, achieving its own greatness in the process. JJ: If you ever chance a peek between the spires of Gotham when its good people sleep, have a care; your eyes may catch the raging fires of Hell… and the guardian demon who bars its gates. 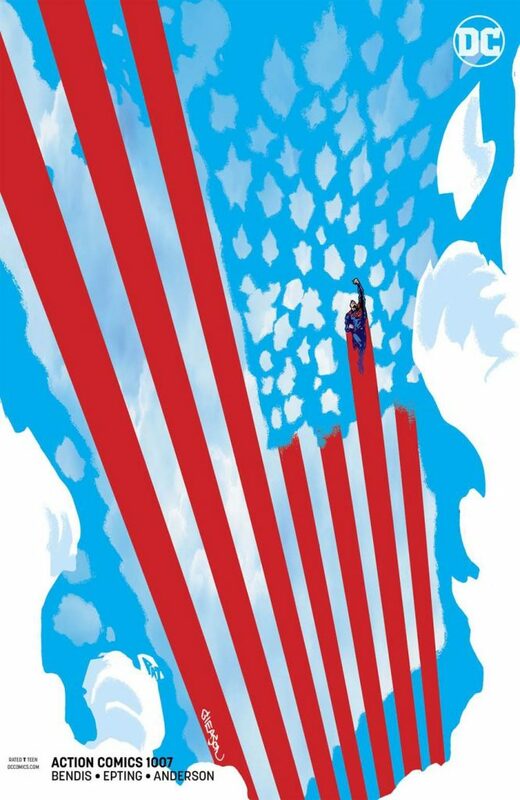 Brian Stelfreeze captures an eternal struggle between light and dark, refuses to assure us who’s winning. In his variant to Detective Comics #997, it’s not the world that has tilted, but ourselves; our perspective contorts, spirals, out of control and wild, and there, behind this silent beast, is the Clown Prince who holds dominion over that chaos. Before his blistering flames have a chance to ensnare you, burn you, you’re pulled back, thrown to the ground, saved by this agent of order. The broad, blue line that keeps the fires at bay. Stelfreeze positions the crusader’s infamous cape just out of our sight, which only makes our grip on reality more uncertain. It could be the wind tugging at his heavy leather wings towards the next lost soul. But from this angle, our eyes can only fixate on the cackling devil who allowed us to see what waits for us when our guardians aren’t looking. From this angle, it’s clear to see which way the wind blows. And it howls.